Gearing up for #GivingTuesday? Let Taproot Foundation Help. September 7, 2017 /3BL Media/ - Is your nonprofit gearing up for #GivingTuesday? We get it, planning and executing a successful crowdfunding campaign for the holiday season can be daunting. That’s why Taproot and Bre DiGiammarino of Indiegogo have teamed up to bring you a free webinar that will teach you how to harness the expertise of marketing, graphic design, videography, and communications professionals who want to volunteer to help your cause. 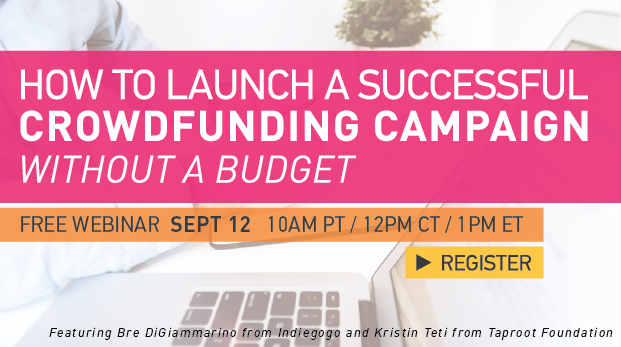 Register now to join us on September 12 and learn how to launch a successful crowdfunding campaign without a budget – just in time for #GivingTuesday. Access to the webinar and Taproot+ are free, now and always.